“Any techie or electronics nut who knows his/her stuff is always mesmerized by FM audio transmissions. The way it works and how basic it actually is, is something worthy of applaud. Even though it was initially implemented in 1933, it is still present in our current world which tells us how important it must have been. For me, as a beginner in electronics, my first and foremost desire was to be able to listen to music wirelessly, and while googling up, I stumbled upon FM transmitters, and it was love on first sight because they could transmit audio to unlimited number or devices unlike bluetooth, and is also long ranged. That isn’t the end of the benefits of FM audio transmission but I’m stopping here to prevent straying off topic. 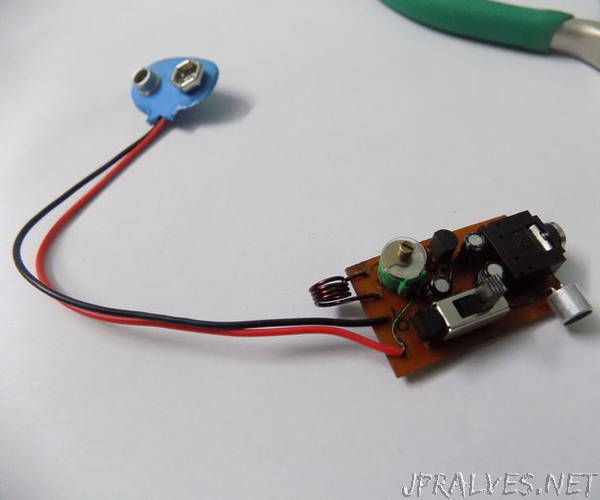 So today, I’m going to guide the readers how they can make their own FM transmitters at home without having to worry about complicated stuff. What is Duo?Duo is nothing but a combination of two FM transmitter circuits merged in one. Why merge, you ask? It’s because it allows the user to easily switch between anchoring(hosting) and audio transmitting without changing the transmission frequency all through a single slide switch. Duo has been designed to be a mini FM transmitter, thanks to SMDs. It is so small that it beats a 9V battery in terms of size and still performs like any other transmitter would. With all that being said, I’d like to conclude that it is also just another fun project you can make yourself and enjoy the fruits of your labour by using it whenever you feel like it..